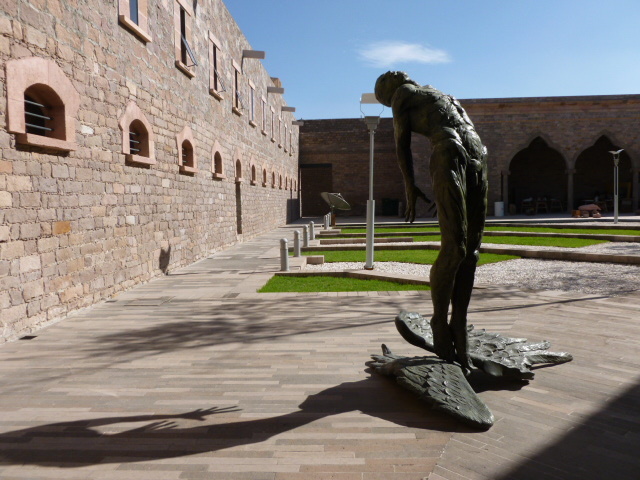 Following their too brief visit with us in San Luis, we traveled together to Guanajuato. Kate and I had heard rave reviews of this city’s attractions so we were delighted to discover “the hilly place of frogs” with Fred and Mary. On the way, we admired the central plaza and ate in Dolores Hidalgo, where Mexico’s struggle for independence from Spain began on September 16, 1810. On that date Father Miguel Hidalgo issued the cry (“grito) for freedom to residents of Dolores before marching on Guanajuato. After centuries of mining and building of flood control tunnels in Guanajuato’s canyon, few traces of its pre- Hispanic past remain. Frogs are now scarce. But the city’s name, “the hilly place of frogs”, which comes from the “P’urhepecha” Amerindian language, is preserved. 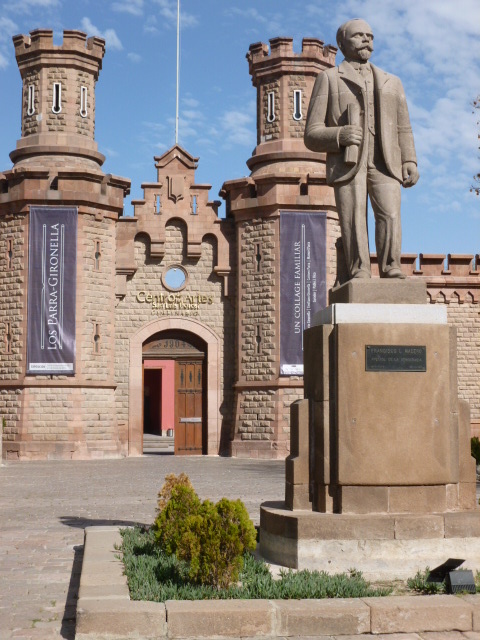 Looking up the derivation of Guanajuato’s name led to some other discoveries. According to Wikipedia, “The government of Mexico recognizes 68 distinct indigenous Amerindian languages as national languages in addition to Spanish.” Furthermore, while Spanish is the language spoken by the vast majority of Mexicans, it is not recognized as the “official” language of the country. The 1917 Constitution commits the nation to preserving the status of the country’s “indigenous” languages. While fewer than ten per cent of the Mexican population now speak an “indigenous” language, the Constitution advocates support of “bilingual” and “bicultural” education. Click on the Slide Show tab on the right above the photos to enlarge the photos and see accompanying comments. The following poem speaks beautifully to the vision which this blog and our work in Mexico hopes to serve. It’s from Sister Joan Chittister’s weekly postings on her visionviewpoint@benetvision.org web site and we print her introduction to the poem and the picture accompanying as well. Sister Joan’s site is one of several which we regularly visit thanks to the excellent internet service we now enjoy. No interruptions in service at a cost less than half of what we paid in the U.S. has squelched the fear that good reliable internet connection would be sacrificed in our move here. On the contrary. We’re now used to reading magazines and the daily Los Angeles Times in electronic format. Now if we could just find a good chili cheese dog there wouldn’t be anything missing from our life here. 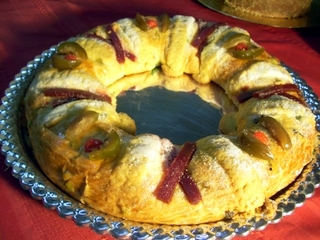 We’ve just learned about the Mexican “rosca” bread tradition for celebrating the Day of the Three Kings January 6. Inside the loaf of “rosca” there is hidden a little plastic monkey, a baby Jesus, or a coin, depending on the household. In some homes, whoever gets the prize has to make tamales for the family. The Day commemorates of course the Kings’ visit to the manger and “the adoration of the magi” of the baby Jesus. So the story of the three kings captured our attention this year. I preached twice on the story from Mt 2:1-12 and described the magi as the first missionaries. They leave their homeland and journey a good distance in response to what they interpret as a call from God. But there is a twist revealed in the story of the magi. Unlike the customary view of the missionary as taking the word of the Lord to a foreign land, it is far from home that the magi find Jesus. And in our two months in Mexico, our experience is closer to that of the three kings than it is to the traditional view of the missionary. Sharing in the life of the Disciples churches here (we have yet to visit the Congregational churches in western Mexico) has confirmed that Jesus is revealed in this setting in what are new and different ways for us. Let me note a feature of worship here that points to an important difference in the way Christian faith is lived out. In all Disciples churches where we have worshipped, “testimonies of gratitude and petition” are made by those attending. It seems there are always four, five or more members of the congregation who are moved to come forward or stand in their pew and give “testimony”. What is typically a brief mention of a concern or a cause for celebration in the States is here an occasion for describing how God has enabled a safe move from the countryside, restored a child to health, relieved a friend from the ravages of addiction. While it is appropriate to ask for prayers of petition also, much of the sharing testifies to the renewal or reconciliation that has already been enabled by the action of God’s grace in someone’s life. But the practice of “testimony” in Mexico also involves evangelical (non Catholic) Christians in recounting how God’s grace revealed Jesus’ love and power in one’s life in the first place. Testifying about how one came to “know the Lord” takes on a different depth and heft where Protestants remain a minority and were in the past persecuted. In Mexico Disciples and other evangelical Protestants pay a price in living their faith. An example came from a Disciples pastor in his fifties who shared with us the childhood memory of seeing a woman bloodied by the attack of an anti-Protestant mob gathered next to a Disciples church. Especially in multi-generational gatherings, like the Men’s Convention a month or so ago, some of the personal testimonies aim to lead younger members present to know and claim Jesus Christ as their personal savior. The Men’s gathering featured a Saturday night campfire where a 78 year old man, “Don Angel”, began the series of personal testimonials by recounting his faith journey. Converted to the evangelical Christian faith by a Disciples minister in the 1950’s, Don Angel continues to be the only non-Catholic member of his birth family. While his wife remains Catholic, Don Angel’s son and daughter in law are Disciples pastors, and his grand daughter is in seminary in Puerto Rico, with the help of a Global Ministries scholarship. 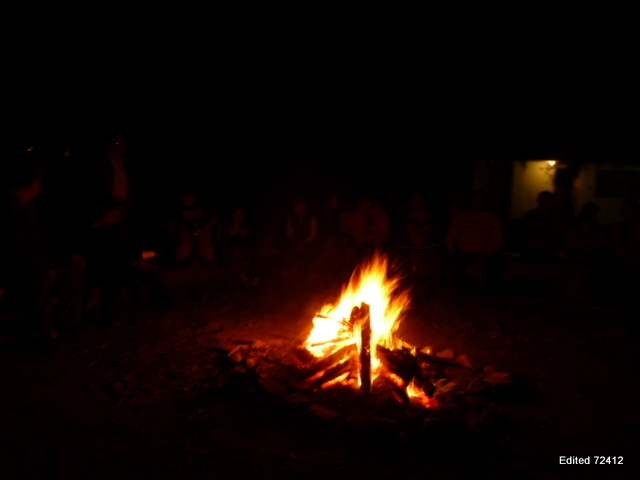 Five or six testimonials followed that of Don Angel, the oldest man present at the “fogata” (campfire). They may have been encouraged by the shaping of the high blazing embers in the form of a heart, another campfire tradition here. A couple of the ministers present began by noting that a similar camp fire years ago in the same setting had yielded a softened heart open to confessing the work of the Lord in their lives. So what gifts do we two missionary “magi” have to bring? Well, one of the gifts WE have already RECEIVED is to be challenged by the question. And right now, our gift to the churches here seems to be found in being honest in sharing our own stories of coming to know Jesus and trying to be faithful.